Carbon fiber materials are a key component in a broad range of innovative technologies. From aircraft components, to blades for power-generating windmills, robotics, and prosthetics, the product provides a strong, light-weight alternative to conventional materials such as steel or aluminum. The market for carbon fiber is projected to grow significantly over the next decade, especially in key markets such as automotive, wind energy, infrastructure, and industrial applications. New, innovative, manufacturing processes for low-cost production technologies hold the key to reducing carbon fiber costs and expanding the market exponentially. Federal and state R&D tax credits are available to stimulate the efforts. This article will discuss the R&D tax credit as it relates to carbon fiber technology innovation. 1. Creating a complex weave of carbon fiber strands. 2. Casting a mold and laying carbon fibers over it, allowing them to cure through the vacuum process. The first method is usually preferred because it results in a stronger product. 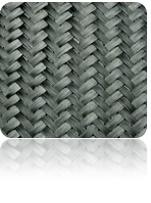 Different types of carbon fiber weaves result in different properties for the composite part. In order to create that part, the carbon fibers, which are stiff in tension and compression need a stable matrix to reside in and maintain their shape. Discovering the appropriate mixtures often involves significant R&D. The carbon fiber composite parts have several desirable traits that can be exploited in the design of advanced materials and systems. The most common uses are in applications which require a high strength to weight ratio. Other applications exploit the material’s high electrical/thermal conductivity or its high corrosion resistance. Though carbon fiber has many benefits, its application has previously been somewhat limited by its higher cost and slower production process. Historically, it has been used in exotic sports cars and airplanes. Such machines carry price tags well into the six figures and their production can generally withstand the impediment to fast production since they are not produced on such mass scale. Innovation however, is beginning to change all that. Last year, BMW produced its i3 electric city car with a body structure composed of carbon fiber and priced it reasonably for around $33,000. Electric cars benefit particularly from carbon fiber because its light weight attributes allow the cars to travel longer distances on each battery charge. BMW is somewhat of a pioneer in carbon production. They actually create the material themselves at about one-third the typical market price per pound. Innovative producers are beginning to create the product at a lower cost and in less time. Teijin, for instance, a worldwide materials producer with a number of operations in the United States uses thermoplastic resin, which softens when heated and hardens when cooled down. The resulting product can be press-molded in a much shorter time. Using this material, Teijin developed the world´s first mass production technology capable of molding a carbon fiber-reinforced polymer (CFRP) structural part in less than a minute. 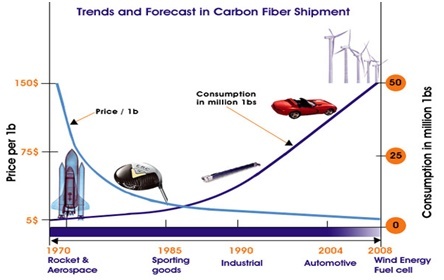 As you can see from the chart above, consumption of carbon fiber increases dramatically as the cost of production decreases. Still, carbon fiber is produced in relatively limited quantities. Currently, total production capacity does not meet demand. Compounding the shortage is the ever-increasing demand for the strong, lightweight product which can be used in a wide array of application. The carbon fiber application/product diagram below presents some of these applications including aerospace and civil infrastructure. With the large demand for carbon-fiber and the inverse trend on the supply side, some innovative producers are attempting to capitalize on the opportunity by inventing low-cost, high speed carbon fiber production capabilities. Some of these initiatives are discussed below. Harper International in Buffalo, NY prides itself on being an expert in innovative carbon fiber processing equipment. Harper initially pioneered the development of commercial ultra-high temperature (UHT) furnaces for the market in the 1970’s. 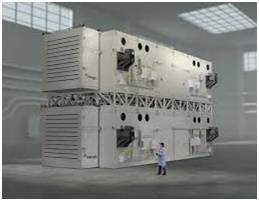 Since then, it has become a worldwide leader in delivering thermal processing solutions including furnaces, oxidation ovens, and complete carbon fiber production lines. Recently, Harper’s R&D focus has been centered on the need to meet the demand for a low cost and renewable alternative to Carbon fiber produced from polyacrylonitrile (PAN) and pitch. By using non-traditional precursors such as lignin, rayon, polyethylene, and blends, customers have the ability to lower their operating costs and reduce the residence time in the oven. In a broader context, Harper supports cutting edge global companies and research institutes in the development of these advanced Fiber materials in the most comprehensive way possible. Their Research & Piloting Facility provides R&D resources that few others can offer with technology services, expertise from lab scale to large production, deep process and material science knowledge, as well as custom engineering support. Some other innovative technologies employed at Harper are described below. Harper’s furnaces address solutions for materials where oxidation is a concern with revolutionary design considerations. Harper offers extraordinary patented, gas-tight designs and superior sealing systems with unique purge chambers. Additionally, because of the high temperatures associated with Harper furnaces, they are experts in energy efficiency innovation and on incorporating materials and design features that result in the conservation of energy, cooling water, and protective atmospheres. While there are several private companies leading the fore front in innovation, collaboration with academia and public entities is vital to forward progress. Some of these collaboration efforts are described below. The Oak Ridge Carbon Fiber Composites Consortium (Oak Ridge, Tennessee) is a public–private partnership enabling a national network for innovations in manufacturing. The consortium’s mission is to foster industry–government collaborations to accelerate the development and deployment of lower-cost carbon fiber materials and processes and create a new generation of strong, lightweight composite materials that will improve America’s competitiveness. The Consortium draws on the broad experience that the Oak Ridge National Laboratory (ORNL) has in research, development, demonstration and deployment of fiber-reinforced composite materials, and leverages the expertise of more than 45 member companies across the entire carbon fiber value chain. It also supports the U.S. Department of Energy’s investment in the new $35 million Carbon Fiber Technology Facility by providing industry perspective on the critically important transition of research and development to commercial application. The Consortium serves as a platform for industry to develop a pre-competitive technology roadmap, and to allow its members to build teaming relationships to capitalize on future business opportunities. Members of the consortium have opportunities to participate in semi-annual membership events in Oak Ridge, and to receive briefings on progress being made in ORNL’s research and demonstration efforts. They also are capitalizing on opportunities to develop relationships with other members along the carbon fiber composites value chain, and to explore opportunities for partnering and collaboration. Oxidation – the unique physics of plasma chemistry are utilized to enhance the oxidation process using less energy and reducing the processing time by over 65%. RMX is expanding its oxidation technology to thermal insulation and flame retardant materials, utilizing typical PAN precursor material and lining. Carbonization – RMX is in the feasibility stage of developing an atmospheric pressure plasma carbonization oven that can achieve the same metrics as the ORNL Microwave Assisted Plasma (MAP) carbonization project, without the vacuum requirement. Surface Treatment – research has expanded to include the utilization of atmospheric pressure plasma for the surface treatment of carbon fiber. The primary focus is not necessarily cost savings in the process itself, but the enablement of the use of low-cost sizings and resins that normally have difficulty bonding to the carbon fiber. This is an important part of the manufacturing process, especially when new low-cost precursors are being used. Results have shown a dramatic increase in surface oxygen content in plasma-treated fibers over wet-chemical or thermo-chemical processing techniques. The Carbon Materials Group at the University of Kentucky Center for Applied Energy Research (UK CAER) focuses on several areas of research, including: solution spinning of experimental fibers, conversion of precursor to carbon fiber, carbon fiber reinforced polymer composites, synthesis and applications of carbon nano-tubes, polymer processing, and industrial and activated carbons. The university operates one of the country's only production lines for spinning experimental fibers and precursor carbon fiber. The system is designed for researching the numerous parameters that are involved in fiber production. Much of the most recent research and development at the University has focused on improving the through-thickness (z-direction) and in-plane thermal conductivity of filament-wound and hand-laid carbon fiber composites. The university is uniquely positioned to partner with industry on the development of new fibers and new carbon fiber products. The University of Tennessee Space Institute offers opportunities to participate in the advancement of low cost pitch based carbon fiber and the development of carbon based composite technologies. Low cost carbon fiber could be in a position to provide enormous advantages to a number of technologies for current and future everyday life, including a number of advanced technology applications that are not commercially feasible, now. 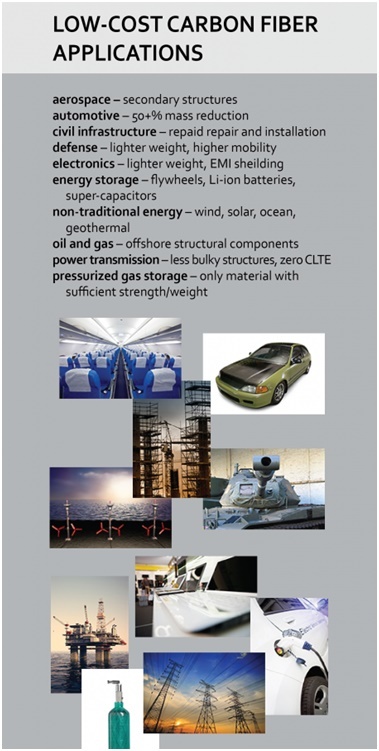 Lightweight automobiles, buses, trains, aircraft, ships and applications including lightweight body panels and load bearing structures and many other transportation systems components, will result in weight savings and therefore result in major savings in the energy used by such systems. Other related technology areas such as rechargeable batteries, fuel cell electrodes, light weight paneling, advanced light weight general structures and fiber reinforced concrete and asphalt are just a few examples. A number of technologies that are currently using other synthetic fibers can use high strength lightweight and low cost carbon fibers to reduce weight, improve performance, and generate new applications that are of technical and commercial interest. Carbon fiber materials are a key component in a broad range of innovative technologies. New, innovative, manufacturing processes for low-cost production technologies hold the key to reducing carbon fiber costs and expanding the market exponentially. Industry and academia collaboration is furthering this pursuit. Federal and state R&D tax credits are available to stimulate the efforts.